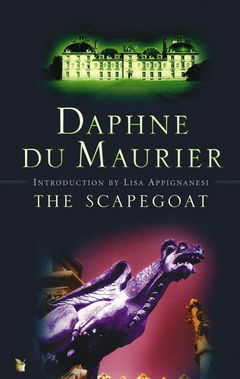 The Scapegoat is the third novel I’ve read recently with a plot that turns on stolen identities. It’s really interesting how differently they deal with the dangerous temptation to be someone else. In each case, the usurper is at least somewhat sympathetic because what he wants is so simple and recognizable: belonging, acceptance, communion. But while in Highsmith’s Tom Ripley this longing becomes an amoral readiness to betray or kill to protect his deception, and in Tey’s Brat Farrar it leads to unexpected heroism in defense of the people he intended to defraud, in du Maurier’s John it becomes something deeper still: in taking over the life of Jean de Gué, our protagonist is drawn not only into a history and a family steeped in their own secrets and lies, but into his own soul. What kind of man does he want to be — is he capable of being? How can his presence, as an undetected stranger in their midst, change the lives of the people Jean de Gué has damaged and now abandoned? In taking their pain and suffering into himself, can he free them somehow from the burdens of their past, even as he’d hoped that to be among them would liberate him from his own failures? Years of study, years of training, the fluency with which I spoke their language, taught their history, described their culture, had never brought me closer to the people themselves. . . . My knowledge was library knowledge, and my day-by-day experience no deeper than a tourist’s gleaning. The urge to know was with me, and the ache. The smell of the soil, the gleam of the wet roads, the faded paint of shutters masking windows through which I should never look, the grey faces of houses whose doors I should never enter, were to me an everlasting reproach, a reminder of distance, of nationality. Others could force an entrance and break the barrier down: not I. I should never be a Frenchman, never be one of them. I drove faster still, overtaking the cars ahead of me, possessed by a reckless feeling I had never known before, the sensation that I myself did not matter any more. I was wearing another man’s clothes, driving another man’s car, and no one could call me to account for any action. For the first time I was free. At first it’s just a lark to John, who can hardly believe nobody realizes he’s not really Monsieur le Comte. That’s a stretch for the reader’s credulity too, I have to say, but the dog at least growls at him (much to the family’s puzzlement), and we learn eventually that Jean’s mistress, too, was not taken in (“A woman would have to be a great fool not to distinguish between one man and another, making love”) — though she hasn’t turned him away either. Figuring out the puzzle that is Jean de Gué’s life is initially interesting and confusing but not terribly meaningful to John; his own missteps cause no deep feeling or alarm. Before long he realizes, though, that in moving into the chateau he has, however inadvertently, inserted himself into a complex and still unfolding story, and the shift from “library knowledge” to real life is fraught with dangers, the worst of them not physical but moral. To be “one of them” is to be called upon to act, even (as head of the family) to lead. But with what motive, and to what result? The chateau, which had seemed a jewel in sunlight, was more forbidding at the approach of dusk. The roof and turrets that had blended against blue took on a sharpened tone against the changing sky. I thought how like a bastion it might have been when water filled the moat, before the eighteenth-century facade of the central portion linked the early Renaissance towers. Were they any more lonely, the silken ladies peering through those slits, than the Renée and the Françoise of today, with the clammy water damping the mouldering walls, and the forest, thick and shaggy, shrouding the very door? Did the wild boar, fiery-eyed, come rooting where the cattle wandered now, and the thin horn of the huntsman sound in early morning when the mist still clung about the trees? What drinking, roystering nobles of Anjou must have clattered forth over the drawbridge to hunt and fight and kill; what love-making by night, what long uneasy births, what sudden deaths? And now, in another time, how much of this was repeated, oddly, in a different way, with stifled emotions and hungers more obscure. Cruelty was of a deeper kind today, wounding the spirit, hurting the secret self, but then it was more openly brutal: only the tough survived, and the lonely Françoise or the frustrated Renée of that age went like blown candles into disease and death, lamented or forgotten by their lords, who, prototype of Jean de Gué, feasted and fought, shrugging a velvet shoulder. I was no longer isolated, watching apart, numb with exhaustion, but one among many, part of St. Gilles. . . . I knew suddenly, with conviction, that it was not a stranger’s curiosity that drew me to them, a sentimental attachment to the picturesque, but something deeper, more intimate, a desire so intense for their wellbeing and their future that although akin to love it resembled pain. This longing, strongly felt, was yet somehow impersonal: it did not spring from a wish to stand well with them, and it embraced, in some curious fashion, not only the village people and those who now seemed part of me, sleeping within the chateau, but inanimate things beyond — the contour of a hill, a sloping sandy road, the vine clinging to the master’s house, the forest trees. Even before this point John has, rather bumblingly, been trying to act in the best interests of his strange, unhappy new family. He’s not overtly successful, but his good intentions are perhaps what Jean’s mistress acknowledges when she remarks, “you have something that he doesn’t possess . . . You may call it tendresse.” It may be, though, that his best course is not to live among them but to leave, taking with him everything he has learned, every burden or grief or sin he has shared while in Jean’s place. When the novel begins, John is contemplating a stay at the Abbaye de la Grand-Trappe: perhaps there among the monks, he had hoped, he would “discover what to do with failure.” “They might not give the answer,” he confides in Jean de Gué on the night of their fateful meeting, “but they could tell me where to look for it.” He ends up at the chateau instead: it is in action, not silence and solitude, that he finds his answer, and his belonging. But is this success? John believes it is just failure in another form: “[failure] merely became transformed. It turned into love for St. Gilles. So the problem remains the same.” After all, he doesn’t belong — not really — and as the novel ends he is once more on the road to the Abbaye, now with a different question that is somehow also the same one: “What do I do with love?” In seeking freedom, he found new obligations; in being someone else, he became, more than ever, himself. Next Article Weekend Miscellany: Bests and Worsts and Turgenev and Middlemarch and More! This sounds very much like the actual case of imposture that took place in sixteenth-century France: a peasant by the name of Arnaud du Tilh took on the identity of one Martin Guerre. I wonder if du Maurier was familiar with it? Good question, Samantha: I don’t know! You’re right that there are some structural similarities, though I don’t know details about the Martin Guerre case so I don’t know if any of the themes are the same. I see there was a 1941 novel about the wife of Martin Guerre, and it was a pretty famous historical case, so it’s certainly plausible that she would have known. Maybe my book club should read Natalie Davis’s book about it next! We always try to follow a thread of some kind from one book to the next. I have enjoyed reading about the identity theft in Highsmith and Tey, but I have not yet read the Du Maurier. So, tomorrow I am off to the library! Thank you for pointing me in the right direction (again!). I think you’ll be intrigued by it. I was also struck by how restrained du Maurier’s prose is here, compared, say, to Frenchman’s Creek. Gosh I read this book years and years and years ago and my memory of it is very hazy. But I do remember it being one of du Maurier’s I most enjoyed. Scintillating analysis, Rohan. You make me want to read it again. Oh and apparently there was a television drama made out of it last year here in the UK that was supposed to be quite good. I don’t know if it’s available, or if it’s the sort of thing you’d like to watch but it would be interesting to compare the adaptation with the original.